An effective multichannel strategy is the Holy Grail for retailers, yet the technology currently available only allows us to join up part of the customer journey. At a talk at Econsultancy’s Future Of Digital Marketing event yesterday, House of Fraser E-commerce director Andy Harding laid out his predictions for how multichannel marketing will develop in the next few years. The retailer was relatively late to e-commerce, launching its first transactional site in 2007 followed by its first mobile site in 2011. The desktop site was then rebranded in July 2011, with online sales now accounting for more than 10% of total revenue. While many retailers offer customers very different offline and online retail experiences, Harding said that creating a single view of the customer using digital is integral to future growth. Digitising the in-store experience is key. Multichannel customers are three to four times more valuable than single channel customer each year. There’s a lot of digital in our stores now. You increase sales of a product three-fold just by having TV looping information about a product. 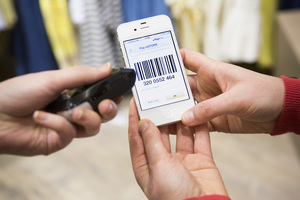 The use of QR codes and iPads is also key to giving consumers a personalised experience. He said that online was the domain of product and range, while offline was more about the brand and product experience. Fixtures Living and Asian Paints were flagged up as examples of this trend. Both have created in-store experiences that focus on product discovery and advice without an overt attempt to make a sale. Asian Paints’ stores in Delhi doesn’t even stock products, yet sales increased by 35% in that locale. House of Fraser is also trialling ‘.com’ stores in Aberdeen and Liverpool where consumers can only buy products online. The initiative was inspired by the success of its online buy and collect service which now accounts for 35% of online orders. He said the Aberdeen .com store is predicted to pay for itself in just 12 months. If you can bring the personalised shopping experience you get online into the retail environment then the results would be amazing. A study by German retailer Neiman Marcus found that consumers who interact with the same member of staff three times are ten times more likely to make a purchase. As a result, they created an app that allows customers to locate members of staff in-store. If they can offer customers a personalised relationship with a staff member then the sales uplift will be dramatic. Harding said that digital fitting solutions are also key, and could have a dramatic impact on reducing product returns. Harding suggested that the use of social in multichannel marketing was unclear as retailers were still unsure of its value. There was initially a land grab to get Facebook likes, but we ended up running in an endless race and didn’t even know why we were running it. While brands such as ASOS and Burberry are positioned to take advantage of social marketing due to the demographics of their consumers, House of Fraser’s customers aren’t as engaged with social media. However, there are still some interesting things that can be done. Harding highlighted Shopcade as an innovative use of social shopping as it allows consumers to monetise their shopping experience by creating a product page that effectively then acts as an affiliate. Similarly Facebook app Wrapp has the potential to be important for retailers as it allows them to target users with free vouchers. It’s wonderfully viral and gives lots of value to both those who are giving and receiving the vouchers. It’s a brilliant concept and one you will see a lot more of. Mobile is increasingly becoming part of the retailing experience, with 24% of UK smartphone owners using their device to check product information in-store. Harding said that mobile is the glue that binds together the multichannel experience. It digitises the consumer and allows you to merge offline and online environments, and that is the store of the future. House of Fraser uses QR codes in-store to give access to product information or let consumers check-in, which then allows the company to target them with contextual advertising. Similarly the House of Fraser app enables the retailer to provide a more personalised experience, including targeted content and a stock checking facility. Harding predicted that mobile payments would be the next game changer, with NFC making credit cards almost obsolete within the next three years. For us it’s a huge issue as we have to reinvest in all our store infrastructure. But we can then give consumers digital receipts, which presents a huge opportunity as we can use that data to market to customers and link offline and online purchases. Much has been written about Connected TV this year, but as yet it hasn’t caught with consumers. Harding predicted that 2013 would be the year that the device gained popularity and said the larger screen and shared viewing experience presents a huge opportunity for retailers. He also suggested that apps such as Zeebox will be important for the future viewing experience, while tablets will eventually be used to control the TV. US internet retailers are more likely than their UK counterparts to target Brazilian and Chinese markets in the next year. However, all agree that use of social media networks and website translations are fundamentally important tools for making progress into international e-commerce markets. After attending two events, most recently the IRCE in Chicago, USA and the IRX in Birmingham, UK back in March, I found several crucial differences in the way that companies in the US and UK were approaching the various international retail markets. Digital Cream San Jose, Econsultancy’s free to attend exclusive rountable event, is less than eight days away. Our new infographic shows the top five reasons to attend Digital Cream San Jose and why you should consider joining us.